BLOG CANDY ALERT! ALL WEEK! I think this is my 5th post for today! WOW! So SCROLL down! You don’t want to miss anything right? Storage Units, Ink & More is sponsoring a Give-away!! ALL WEEK!! HOOT HOOT HOORAY! That explains this post! LOL! I am excited to share my peeks for today with the *soon to be released* set Limitless Limbs from Pink Cat Studio. Release date August 6th! This set features 2 different tree’s that are empty. Well, that is until YOU decorate them! Its like celebrating Christmas (the tree decorating) all year long! You will be amazed by the images Melissa put together for the tree’s. You can have items for EVERY possible occassion. Really cute. Trees are so hot right now. I will share my most favorite of my samples in 2 days! I love it, and am saving the best for last. For now I will share my birthday tree! The little Q.T. Hooty is in this set. 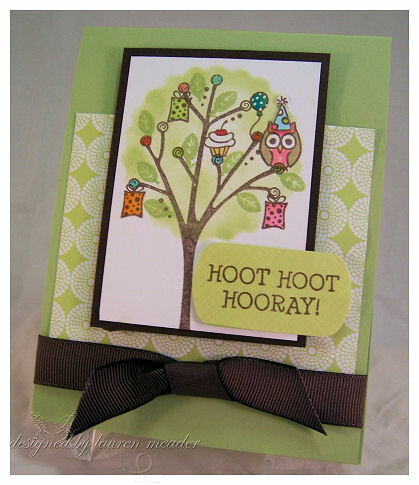 (The sentiment is from the Q.T.Hooty set) I thought he was so cute celebrating his birthday! Presents hangin from the tree, and he has his party hat on, balloon, and of course his cupcake, from yesterday’s post from Chef Billy! LOL! I stamped my tree, and images. Added some leaves, and sponged in the green using a nestability die as a template. EASY!! This one is a little different. Whimsical but almost elegant. Notice the different tree bases! Cute huh? I love Kraft Lemon Tart, and Chocolate together, with that spot of white. I colored my pears with a Souffle gel pen. They are pretty in person. This is a very clean, and simple layout, and I LOVE it. I hope ou do too. Love to hear your feed back on what you are seeing too. OK Im wiped!! So much to do, so little time. Make sure you check out the other blogs & Melissa’s site for more details!! I love this set. I mean really love. This is Floral Frenzy (as is he just because). 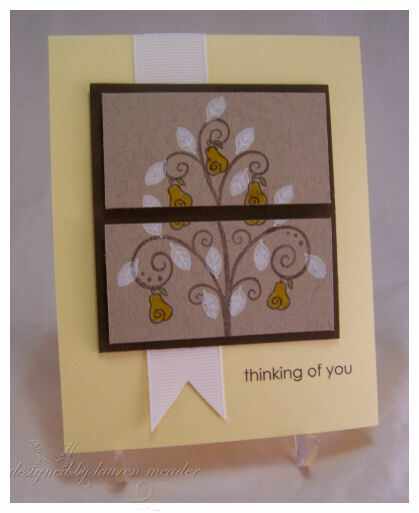 I like the solid and open image combo, and the pattern in the leaves. Just so pretty, and to me, versatile. I colored the petals with my Copic markers. I drew my stems with a ruler and marker tip. Pretty HOT!! I LOVE circles-and making my sentiment POP out of one. 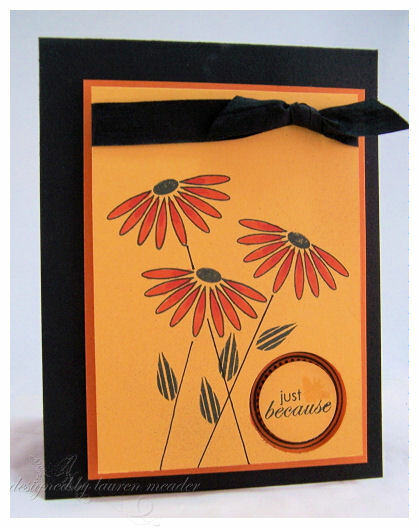 I used borders & corners circle set (a must have for me), stamped on the base layer (pumpkin pie)-which peek through the top layer (summer sunset). Little bitty bee is from the Honey Bees set. I was thinking summer sunset, on a HOT day, when creating this. I wanted to make a card with a COLOR pop, and anytime you use black, it really does help achieve that. I also chose NO WHITE! Don’t get me wrong I LOVE white, but it’s nice to NOT use white sometimes. FULL ON COLOR! I hope YOU try a non white card soon too.